The expansion of knowledge economy, globalization, and economic competitiveness has imparted importance of knowledge and innovation in local economies worldwide. As a result, integrating knowledge generation and innovation considerations in urban planning and development processes has become an important agenda for establishing sustainable growth and long-term competitiveness of contemporary cities. Today, making space and place that concentrate on knowledge generation and innovation is a priority for many cities across the globe. Urban knowledge and innovation spaces are integrated centres of knowledge generation, learning, commercialization and lifestyle. In other words, they are high-growth knowledge industry and worker clusters, and distinguish the functional activity in an area, where agglomeration of knowledge and technological activities has positive externalities for the rest of the city as well as firms located there. Urban knowledge and innovation spaces are generally established with two primary objectives in mind: to be a seedbed for knowledge and technology and to play an incubator role nurturing the development and growth of new, small, high-technology firms; and to act as a catalyst for regional economic development that promotes economic growth and contributes to the development of the city as a ‘knowledge or innovative city’. 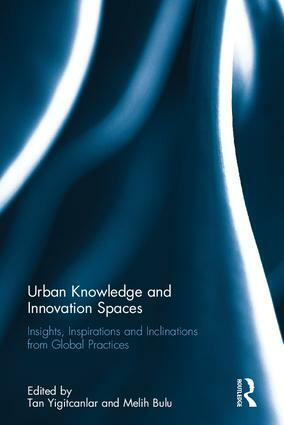 This book contains chapters reporting investigation findings on different aspects of urban knowledge and innovation spaces, such as urban planning and design, innovation systems, urban knowledge management, and regional science. It was originally published as a special issue of the Journal of Urban Technology. Tan Yigitcanlar is an Associate Professor at the School of Civil Engineering and Built Environment, Queensland University of Technology, Australia. He has been responsible for research, teaching, training and capacity building programs on the field of urban planning, development and management in esteemed Australian, Finnish, Japanese and Turkish universities. Melih Bulu worked at various sections of the private sector both as professional and entrepreneur. He has been working on city competitiveness projects for the last two decades. His main interest areas are urban technologies and city competitiveness strategies. Professor Melih Bulu is, currently, the Rector of Istinye University, Turkey.